Every day, Americans rely heavily on their many electronic devices, from remote controls and key FOBs to power tools and pacemakers. In 2018, there were an estimated 257.31 million smartphone users in the United States. Smartphones are only one of many devices that run on batteries, so it is no surprise that the Environmental Protection Agency (EPA) estimates that over three billion batteries are thrown away each year in the U.S. Batteries are made up of heavy metals including cadmium, lead, lithium, nickel, mercury and zinc. Over the years, battery manufacturers have been working to reduce the amount of toxic material in batteries – for instance, the use of mercury has been reduced by over 98 percent since the 1980s. However, there is still significant room for improvement when it comes to reducing the hazardous materials that are found in batteries mitigating their impact on the environment. One of the most significant concerns about the heavy metals found in batteries is that they can contaminate the water supply when batteries are not disposed of properly. When batteries end up in a landfill, their heavy metals react to rain water which forms a toxic soup that can infiltrate the ground water. This is the primary reason why it’s critical to properly dispose of batteries – and recycling is the best option. Not only does battery recycling help with keeping toxins out of our water supply – it can help conserve natural resources by reusing the metals and minerals found in batteries. But just how are batteries recycled? According to Battery Solutions, in order to be recycled, batteries must be properly sorted by chemistry. Some batteries are mechanically processed and some use high temperature metal reclamation (HTMR), and still others use a combination of the two methods. There are a variety of options for homes and business to recycle batteries and electronics. At UMB, we have been recycling batteries and handheld electronics since 2012 via a partnership with Battery Solutions. Through department volunteers and our property management team, UMB uses Battery Solutions’ iRecycle Kits for collection. UMB associates can also bring in their home batteries and handheld electronics to recycle. The single stream collection pail (meaning that batteries do not have to be sorted) includes a pre-paid shipping label so that once it is full, it can be immediately shipped back to Battery Solutions. Upon receiving the full pail, Battery Solutions automatically mails a new pail to the UMB department that submitted the return. 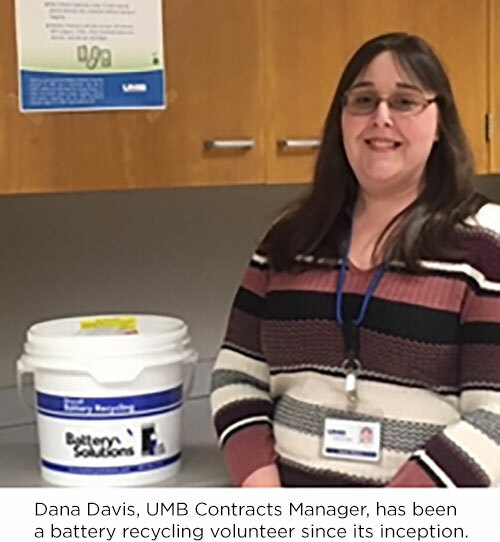 Each month, UMB receives a Confirmation of Reclamation that provides the number of batteries recycled for the month and confirmation that the material was recycled in compliance with federal and state laws and regulations. Since 2012, UMB has recycled over 3,700 pounds of batteries/handheld electronics. Call2Recycle: This group collects rechargeable batteries and cell phones. Their website provides information on Kansas City metro area collection sites such as Home Depot and other participating stores where you can drop off rechargeable batteries and cell phones to be recycled. KCMO Water Services Household Hazardous Waste (HHW) Center: Disposal of single-use and rechargeable household batteries is available through this group for residents of participating communities in Missouri. Overland Park HHW Centerand the Olathe HHW Center: These groups facilitate disposal of single-use and rechargeable household batteries for residents of Johnson County. Looking ahead, there may soon be a day when battery disposal is no longer a concern. In fact, researchers at Penn State have developed a new way to create lithium-ion batteries that could increase the performance, energy density and safety of batteries used for cell phones, electric vehicles and more.2 Longer life and better performance of batteries will go a long way in helping curb the amount of batteries that need to be disposed. In the meantime, however, it’s important to responsibly dispose of batteries, and the best option is the best option.